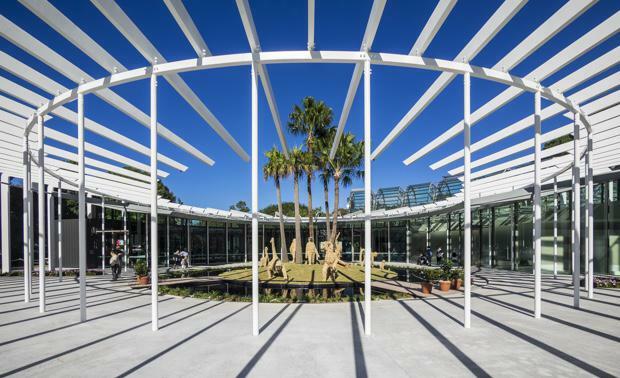 Sustainability, flexibility and inspiration were the three requirements captured, created and delivered by PTW Architects – the lead architect firm who designed the Garden’s 200th birthday masterpiece, The Calyx. Unveiled this week, The Calyx (pron. kal-iks, def. ‘The outermost whorl of flowers’) is a world-class horticultural space that will showcase ever-changing exhibitions, launching with Sweet Addiction – the botanic story of chocolate. “Designing a building for a flexible horticultural display – that can also be used as an interchangeable event space at night – set within a landscape of national historic importance, required an architectural approach that would not detract from the importance of its setting,” said Troy Uleman, Project Director of PTW Architects. Built at the site of the Arc Greenhouse in the Garden, the intelligent and sensitive architecture of The Calyx was designed for it to reinvent itself through emotive and informative exhibitions (that change every six to nine months). Working with Cockram Construction, the PTW team designed the highly flexible building using existing elements of the Arc, originally designed and constructed in 1994 by renowned Australian Architect, Ken Woolley, whilst retaining the extraordinary design quality, integrity and innovation of the existing structure. The showstopper and most visually engaging element of the building is the new Iris. The circular steel structure is the most highly visible piece of the building from afar and contains the foyer, education and retail space that can be turned into an event space at night with retractable walls that allows the exhibition and event space to be combined.